Join A&K’s world-renowned Expedition Team aboard ‘Le Laperouse,’ embarking on a shore-hopping exploration of northwestern Australia’s stunning Kimberley region. Please click here for to view cruise details on our 2020 Kimberley departure. Assemble in the pearling city of Broome for a leisurely, beachfront prelude to your expedition cruise. Then, join A&K’s world-renowned Expedition Team aboard ‘Le Laperouse,’ embarking on a shore-hopping exploration of northwestern Australia’s Kimberley region. Discover a vast, untouched wilderness of far-flung islands, stunning tidal waterfalls, biodiverse coral reefs, riverine mangrove forests, historic Aboriginal sites, cavernous coastal gorges, towering mountain ranges and exotic wildlife. 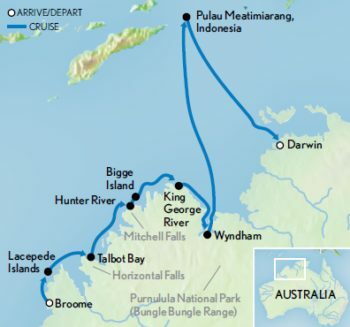 Wind down your expedition with a relaxing day at sea, disembarking in Darwin the following morning. Arrive in the city of Broome, poised at the western edge of the vast Kimberley and hemmed by the blue Indian Ocean. You are met and transferred to your hotel near iconic Cable Beach. The largest city in the Kimberley, Broome is home to over 14,000 residents, yet every bit as daring as its more sparsely populated counterparts. Spend the next day exploring at your leisure, taking in this swashbuckling treasure and its sweeping beaches, cinematic sunsets and relaxed atmosphere. Tonight, meet your fellow guests at a welcome cocktail reception and dinner. A day of adventure awaits with A&K experts who take you beyond the surface in ever-splendid Broome. Join a city tour that reveals Broome’s historic pearling industry and rich multicultural past. Later, your adventure moves from the shore to sea when you board ‘Le Laperouse,’ your luxury expedition cruiser for the next 10 nights. Channel. The “Lacepedes,” as they are often called, are an important nesting site for green sea turtles and several species of seabirds, including brown boobies, red-chested frigate birds, crested terns and speckled ruddy turnstones. Horizontal Falls: An exciting visit awaits at Horizontal Falls, described by David Attenborough as “one of the greatest natural wonders of the world.” Set within Talbot Bay, the unique, horizontally flowing waterfalls are created when massive and intense tidal currents squeeze through two narrow gorges. Experience the phenomenon on a boat excursion that takes you close to these unique falls. Montgomery Reef: The Kimberley’s theme of extreme tides continues at Montgomery Reef, Australia’s largest inshore reef. Board Zodiacs to explore the reef system’s lagoons, islets and rushing channels. The denouement comes at low tide, when water dramatically cascades off the reef’s emerging sandstone platform covered in coralline and algae, perchance revealing astonishing sea life. Freshwater Cove: Enjoy a guided bushwalk at Freshwater Cover that leads to a cave depicting indigenous rock art. A magnificent display of sacred Wandjina figures, the ancient paintings reveal the ways of the Worrorra people, their myths, traditions and powerful connection to the sea. Mitchell Falls: Opt for a thrilling helicopter flight over the vast Mitchell Plateau to the sandstone-carved Mitchell Falls, which tumble through a series of emerald pools into a gorge. Explore the surrounding area on foot and perhaps enjoy a refreshing swim in the freshwater pools formed by the falls. Hunter River: Join your naturalist guides and navigate by Zodiac through the river’s small tributaries fringed by mangroves and tidal mud flats, searching for crocodiles, mud skippers and fiddler crabs, and the many bird species that nest in the dense vegetation. Philip Parker King named “Swift’s bay” after Jonathan Swift, the author of Gulliver’s travels. Located in the Bonaparte archipelago, Sacred to the indigenous Worrorra people for centuries, Swift Bay home to an incredible array of indigenous rock art in multiple galleries.. Here, we have the opportunity to view two distinct styles of indigenous rock art, the Wandjina (or Wanjina) style as well as the older Gwion-Gwion, also known as the “Bradshaw” style. Arrive in Kooloma Bay at the mouth of the King George River, named in honor of King George V. Our naturalist guides pilot Zodiacs upriver through a spectacular canyon, draped in sandstone cliffs, gorges and mangroves, where you may also spy impressive Aussie wildlife, such as the saltwater crocodile. Arrive before the awe-inspiring King George Falls, plummeting from an elevation of 276 feet. Beautifully poised between rugged hills and Cambridge Gulf in the northernmost region of the Kimberley, the former goldrush town of Wyndham is the gateway to a bounty of photogenic wetlands. This includes the spectacular Ord River, where you may spot unique birds; the man-made Argyle Dam; and Purnululu National Park, home to the iconic Bungle Bungle range. During this stop, you may opt for a wildlife cruise on the thriving Ord River or a scenic flight over east Kimberley and the Bungle Bungles, one of Australia’s greatest natural wonders. Enjoy a day at sea and the opportunity to unwind with fellow guests and your Expedition Team, while ‘Le Laperouse’ cruises to Pulau Meatimiarang, Indonesia, to clear customs. Take time to reflect on your adventures, share photos and attend another intriguing lecture. 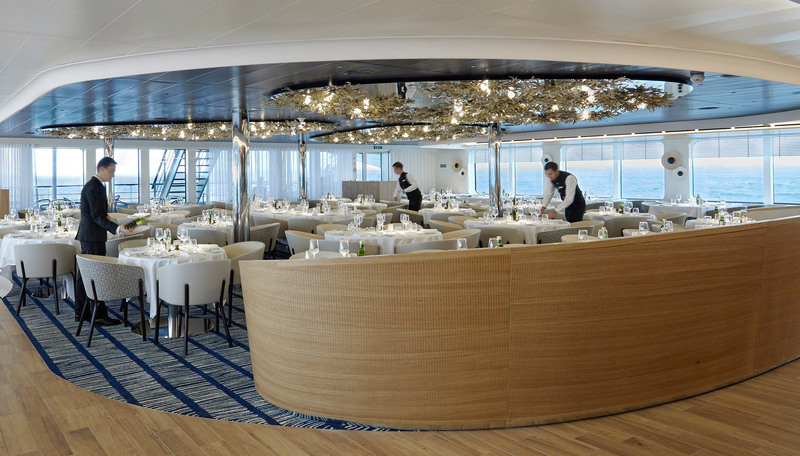 You may also choose to relax and enjoy the ship’s facilities, perhaps at the spa or in your room with views from your own private balcony. Later, join a special farewell reception and dinner, a celebration to mark the culmination of an unforgettable expedition. Note: Activity level is moderate. This cruise includes regular Zodiac boat excursions and walks over uneven terrain, with some optional, more challenging hikes. Due to the nature of expedition cruising, this itinerary is subject to change. Prices based on per person double occupancy. Journey Details: This journey contains some active elements. Triple occupancy is available in categories 4, 5 and 6; quadruple occupancy is available in category 6. Ship categories 1 and 2 will be accommodated at the Kimberley Sands Resort & Spa. Ship categories 3 through 8 will be accommodated at the Cable Beach Club Resort & Spa. Minimum age is 10 years. First group event: welcome briefing on June 21. Last group event: ship arrival and disembarkation at 9:00 a.m. on July 2.